Preheat oven to 350 degree F. Spray loaf pan with cooking spray. Melt butter in a large bowl in microwave. When butter is still warm, whisk in sugar until sugar dissolves. Let cool slightly. Add eggs and vanilla extract, mix to blend well. Sift in flour mixture, in two batches, to butter mixture. Mix well after each time. The batter will become stiff like a cookie dough. Fold in sour cream, then fold in mashed bananas and walnuts. Bake in preheated 350F oven for 1 hour, or until toothpick inserted comes out clean. Sugar: Original recipe calls for 1/2 cup sugar but I cut down to 1/3 cup, and it turned out just nice. I also whisk to melt sugar in warm melted butter. Sour cream: I only had 1/4 cup sour cream remaining in the fridge, so I used heavy whipping to fill to 1/2 cup. The bread turned out moist and fluffy. Alternatively you can also use yogurt. The bread freeze well. Keep it in a closed bag. Reheat in low temperature oven until warm if desired. Sift flour, baking powder and salt into a big mixing bowl. In a small bowl, smash bananas with a fork until fine. Add in egg yolks, milk, cooking oil and vanilla extract to blend well. Pour yolk mixture to flour mixture all at once. Use a hand whisk to mix until no dry flour remains. The batter will be lumpy. Whip egg whites and sugar until the peak forms. Fold in whipped egg whites into the batter in 2 batches. 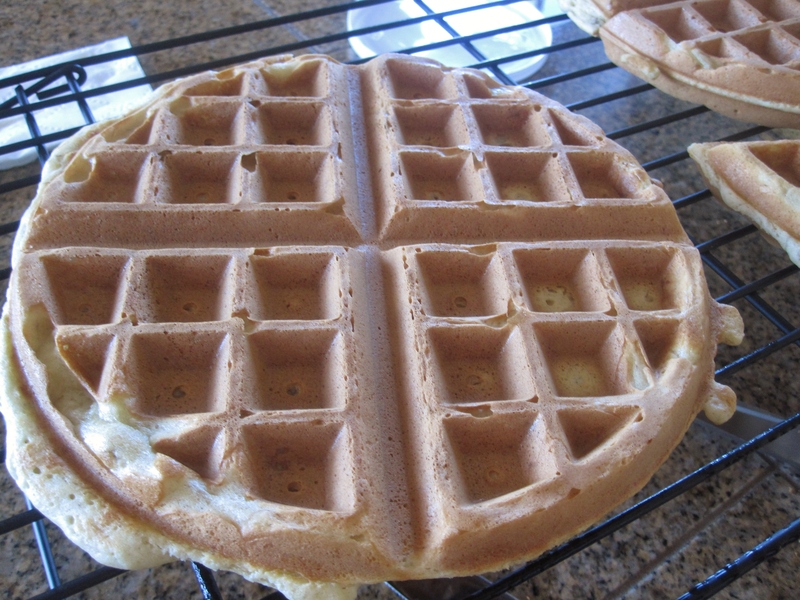 Cook on waffle iron as directed in the instructions. Extras can be frozen for quick breakfast. When I shop at local farmer’s markets, I always temp to buy all kinds of delicious summer fruits, and the result is buying too much– in this case it was 1/2 flat of fresh strawberries (after I already bought 3-4 pounds of stone fruits)! So, adding the last 2 over ripe banana on the kitchen counter, here comes the strawberry banana cake. It’s actually a fluffy banana cake, but with strawberries on the top. 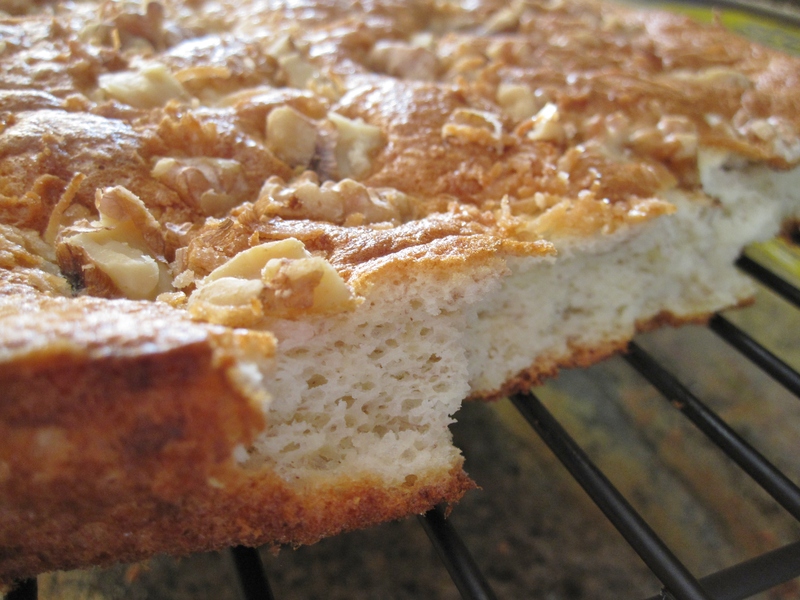 It is pretty much a flat chiffon cake with all that fluffy and light texture. Oh, and the strawberries taste so delicious too! Line a 9 x 13 x 2 baking pan with parchment paper. Preheat oven to 325°F. Prepare yolk mixture: In a large mixing bowl whisk yolks and sugar with a balloon whisk, until it is pale yellow and fluffy. Mix in mashed bananas, vanilla extract, butter and salt to combine. 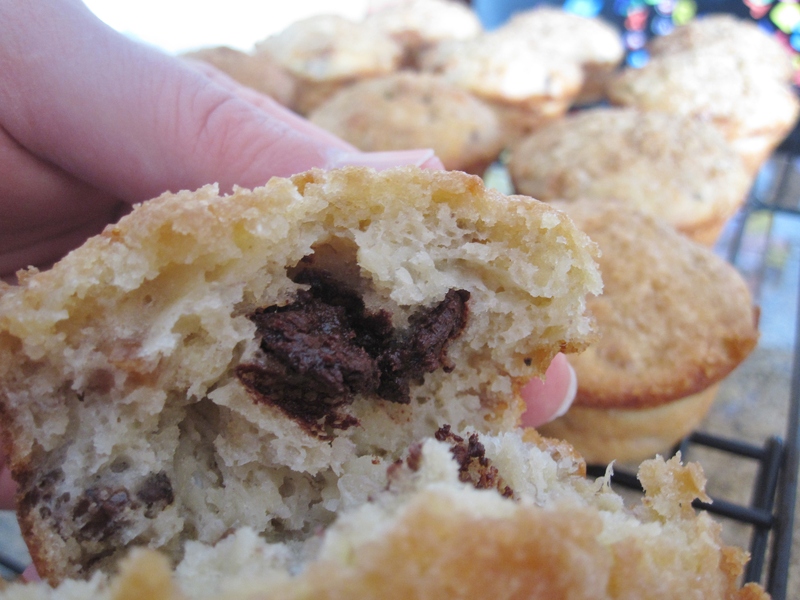 Sift in cake flour, baking powder and ground cinnamon combined, in 2 batches. Mix until no dry ingredients appear. Prepare egg white mixture: In a separate bowl, whip egg white and cream of tartar until frothy. Gradually add in sugar, one tbsp at a time, and whip on high speed until soft peak (whipped egg white should have a little curl at the end tip when lifted up). Gently FOLD IN whipped egg whites to yolk mixture, in 3 batches. Pour cake batter into cake pan. 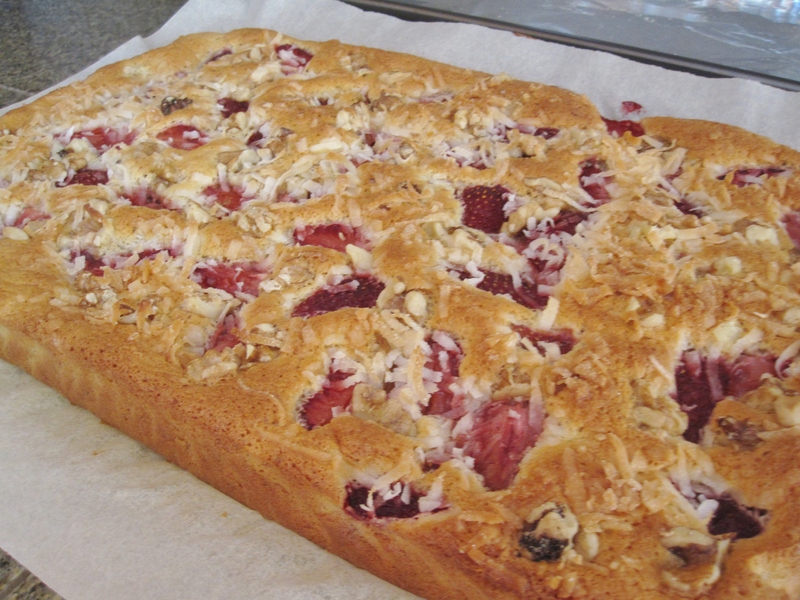 Sprinkle strawberries, grated coconut and walnuts on the top. Bake in preheated oven for 25-30 minutes, or until the cake is golden brown and a toothpick inserted in the center of the cake comes out clean. Remove the cake with parchment paper lining to a rack to cool. 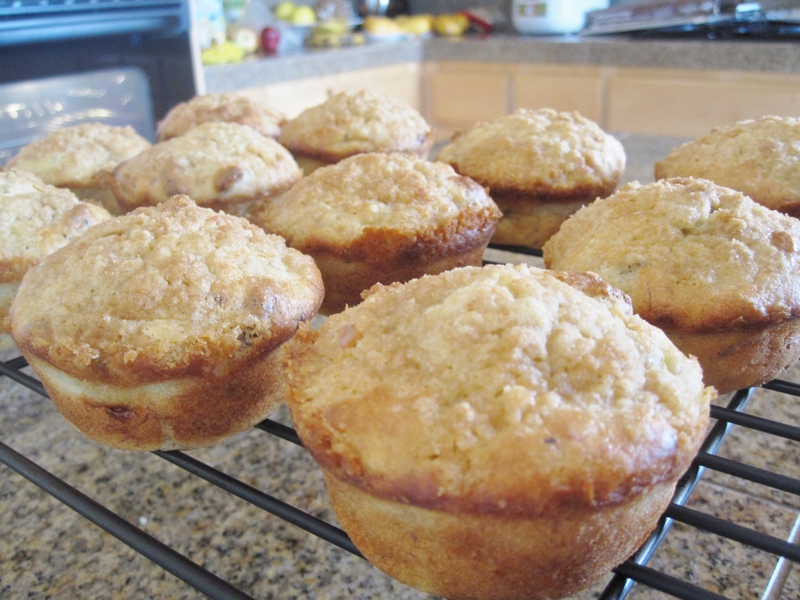 What to do with overripe bananas, besides banana bread, banana muffins and banana waffles? 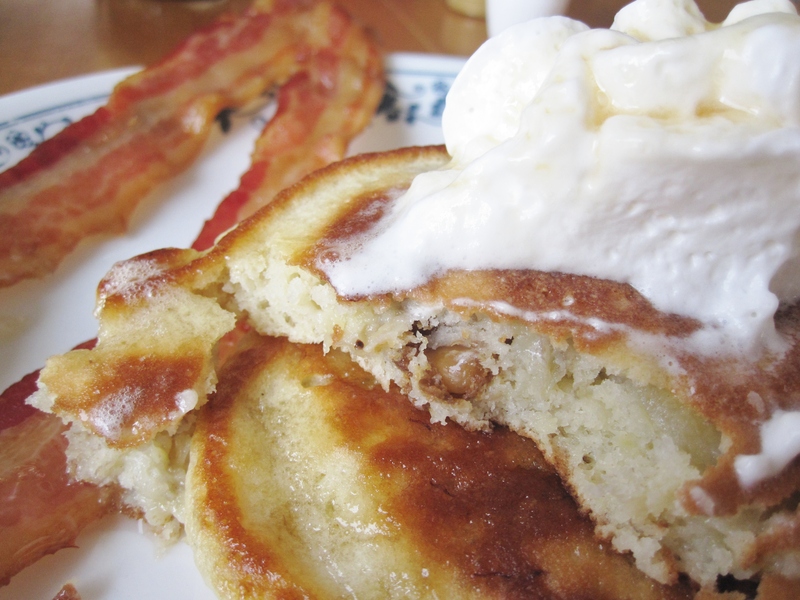 Richard suggested banana nut pancakes, and here they are! This was my first time making banana nut pancakes. Since I didn’t have time searching for the “perfect” banana nut pancake recipe, I use my fresh corn pancake recipe as a reference. And, I’m happy the pancakes turn out well– fluffy and happy 🙂 I froze some extras, and they taste pretty good too after warming up in microwave. In a separate bowl, mash bananas with a fork. Add in milk, vanilla extract, melted butter and eggs. Hand whisk to combine. Pour the wet mixture into the flour mixture all at once. Stir until the batter just combined. The batter will look lumpy– DO NOT overstir. Add in chopped walnuts and stir once to incorporate walnuts into batter. 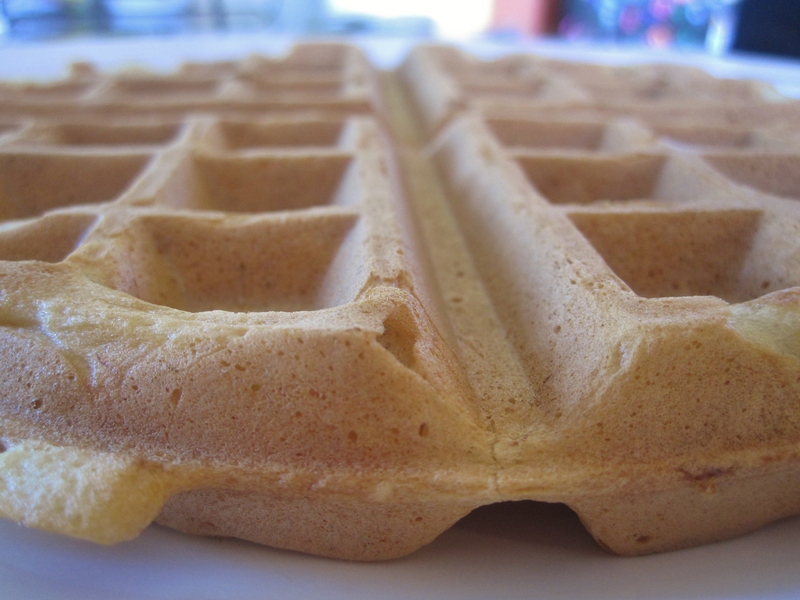 Cooked pancakes may be frozen for quick breakfast, just heat up in the microwave. I have over ripe bananas again! This time I’m not interested in banana quick bread, nor waffles or pancakes. 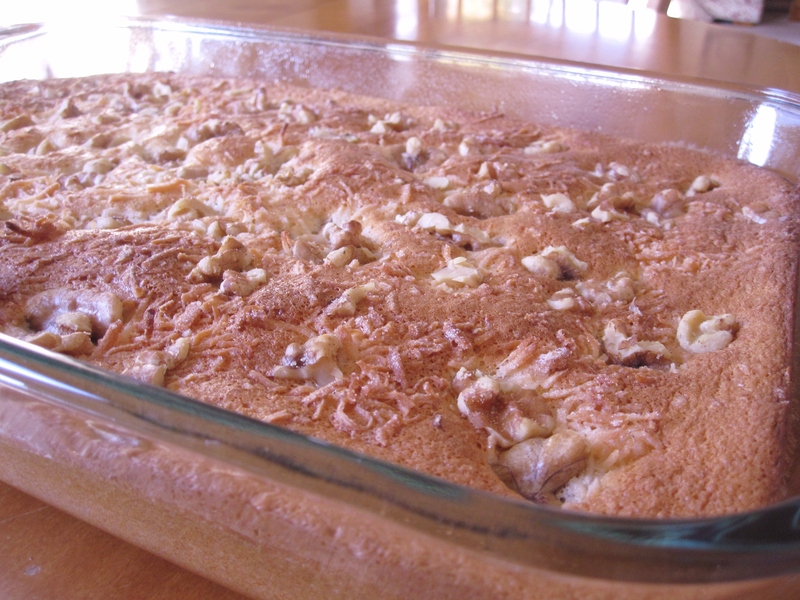 I searched online for light and fluffy banana cake recipes, but didn’t find anything good (at least from all the food pictures– forget those recipes without picture!). So, I decided to throw in some ingredients together and make my own banana cake. This cake is kinda like my banana chiffon cake, except it is baked in a rectangle 9 by 13 inch glass baking pan. Although it is much lighter and fluffy than average cakes, it is still a little denser than a chiffon cake. Oh, the cake bottom stuck on the baking pan even though I sprayed with cooking oil. Next time I should grease the pan really well before pouring in cake batter. One nice and crunchy touch is the coconut and walnut sprinkles on the top, especially the finely shredded coconut– it gives a nice sweet crunch and flavor to the cake. Love it ! Gently FOLD IN whipped egg whites to yolk mixture, in 3 batches. Pour cake batter into a well greased 9 x 13 inch cake pan. Sprinkle grated coconut and walnuts on the top. Bake in preheated 350°F oven for 20 minutes, or until the cake is golden brown and a toothpick inserted in the center of the cake comes out clean. Let cake cool in pan for 5 minutes before transferring out to continue cooling on a rack. 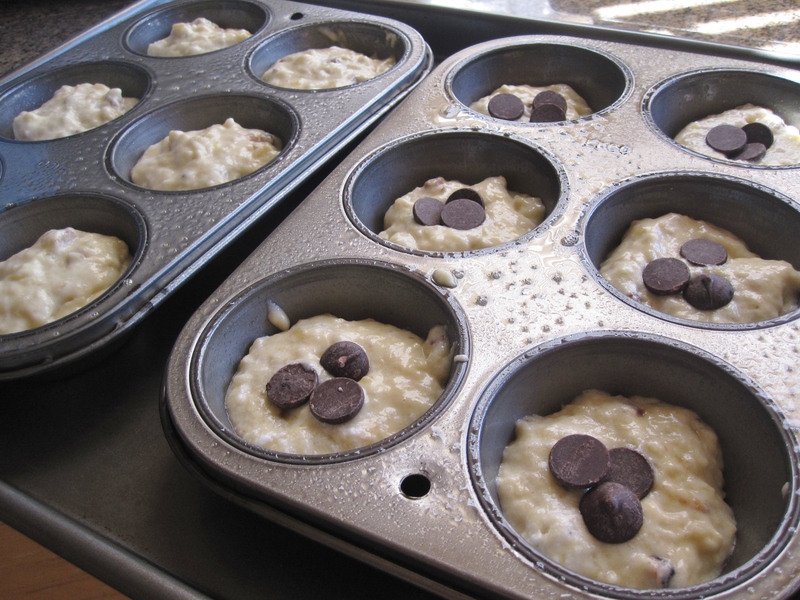 Baking pan: grease the pan really well or use parchment paper for lining to prevent cake sticking at the bottom. Baking time: I baked at 350°F oven for 20 minutes and I noticed the edges of the cake are a little dry. Try 325°/20-30 minutes next time? I don’t like to eat banana as a fruit, but I do like banana in food. As a child growing up in Malaysia, fried banana was (and still) my favorite tea time snack. 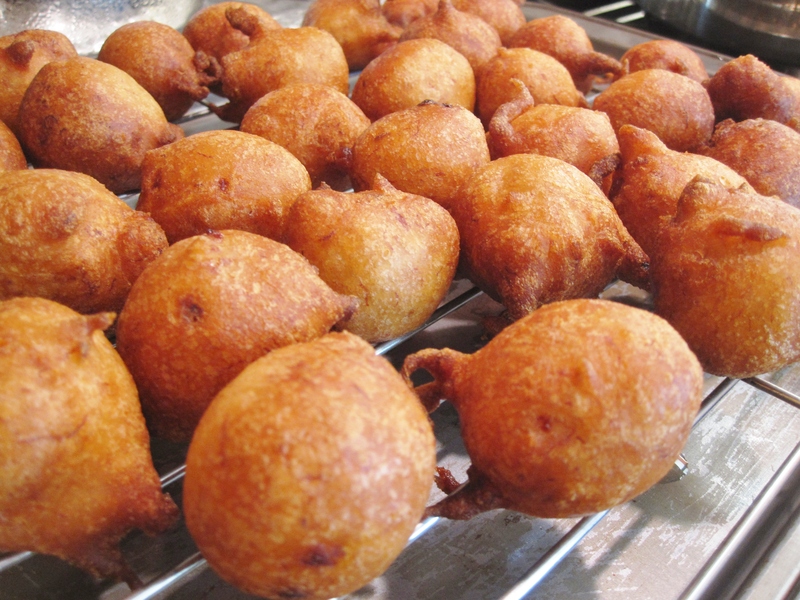 Anyhow, back to banana fritters– Although there are banana fritters selling in Malaysia, I never had one before until I was in US. There was a Jamaican food vendor selling (plantain) banana fritters at a local farmer’s market. I like their fritters but somehow it was not as crispy as I expect. Ever since I was successful making fresh corn fritters, I thought why not try it on banana? My first trial on banana fritters turned out pretty good– when the fritters were fresh and hot, they were crispy on the outside, and tender (almost tender like a funnel cake) on the inside. 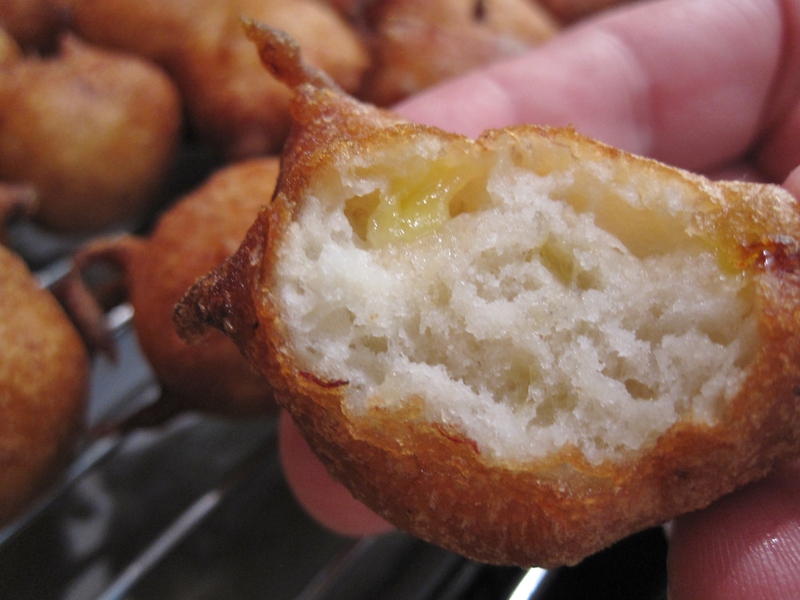 But when the fritter cooled down they were denser– still good but not great. Heat up enough oil in a deep medium pot over high heat (I like to use a old medium pot for frying– deep enough for the food to “swim” inside, and also less chance for oil to splash onto the stove). Insert a bamboo skewer/chopstick into the oil. When there are lots of bubbles forming quickly around skewer/chopstick, the oil is ready for frying. Mix all ingredients together. With the help of two spoons, quickly but carefully drop a tablespoon of batter into the oil (one spoon for scooping out batter, the other spoon for pushing batter into the oil and also catching any batter dripping). The batter will sink to the bottom of pot then float and puff up. Turn down to medium heat, and turn over the fritters to brown evenly. When fritters are golden brown, turn heat back to high for a few seconds before removing fritters– this is to make the fritters extra crispy and less oily. Serve immediately.